Cordray Farms Beef in the store and last call on applewood smoked hams! Ordering the last of the Christmas hams to be applewood smoked today! We WILL sell out. If you'd like for me to hold one for you, please call today. Halves are 7 to 8 lbs. Wholes are 15 to 17 lbs. We butchered a cow for the case and now have fresh beef briskets and burger. Steaks will come later after they've aged. For the first time this year, we've made Peppers and Cheddar beef smoked sausage, too. Stop by to pick up some Cordray Farms beef summer sausage for Christmas gifts. They fit nicely in paper wine bottle sleeves. Still have plenty of bacon and fresh sausage for your holiday breakfasts! And wrap it up with Salt and Vinegar, Ranch, or Southern Style pork skins for those football games! For those of you new to this list, just a reminder that our store will only be open for one more month. Our last day is January 11th. After that, we're open only by appointment. So if you've been thinking about stopping by to see us, we have the best inventory of everything we carry right now. We'll be seeing hundreds of hunters in the next few weeks through the end of the season and holidays and all our stock will be gone! Open 9 am to 9 pm, Mon.- Sat. and Sunday evenings 6 pm to 10 pm. Closed all day Christmas Eve and Christmas Day. Open all day New Year's Eve and Day. Give me a call to reserve your fully cooked applewood smoked hams. We have a few ready now and they can be picked up until Dec. 21st. Large orders for corporate gifts need to be called in this week if possible. Whole hams are $2.89 per lb. and halves are $3.19 per lb. We've cooked up some more summer sausage and have plenty of applewood smoked bacon both in thick and thin ready in the store. Hope this email finds you doing well as you prepare for the holidays! Just a quick note to wish you a happy Thanksgiving and remind you of what's available during these last months of our open season. Fully Cooked Applewood Smoked Hams, whole or halves - $2.89 per lb. whole or $3.19/ lb. for halves. We'll probably sell out of these by Wednesday afternoon but will be cooking up a new batch for Christmas. Call us if you want us to reserve one for you. Beef snack sticks - plain, cheese, or with cheese and jalapeno. We're closed all day on Thanksgiving Day, Christmas Eve and Christmas Day. We're open 9 am to 9 pm Monday - Saturday and Sunday evenings 6 pm to 9 pm through January 1st. Then we have some abbreviated hours Jan.2nd - 11th (9 am to 6 pm - No Sundays) before changing to our regular appointment only off-season schedule. I hope you get a chance to stop by the store before we close for the season! I confess... I can't keep up! This is devotion! Crutches and a cast didn't slow up the taking of this big pig! Sam Brown picked up his standing turkey mount today. Joe Glick got his first deer tonight. Crazy horns from a Buck that may have had a pedicle injury in the past. George Postell brought in this beauty this morning! We had two NICE bucks this am. 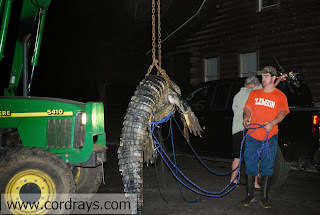 Taylor Outdoors guided their client to this big gator last night! Click here for more information on Taylor Outdoors. Terry Richberg got an 11 footer! Bryan Logan brought in this big bull gator weighting 217 lbs. 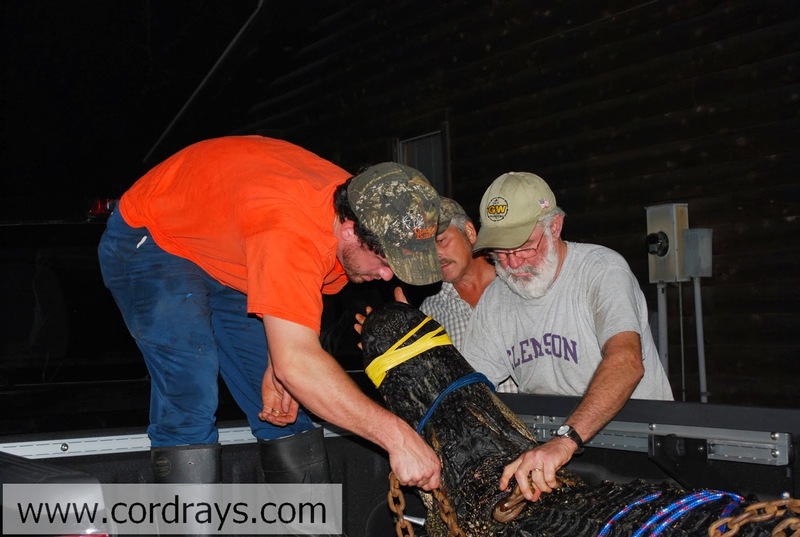 William Cranford's alligator was over 10 ft. long. Sorry, folks! I don't know why but Blogger isn't letting me upload pictures today. Go to our Facebook page to see them. Sonny Kay got an 8 point weighing 156 lbs. Mary Holmes and Carter Welch came in to celebrate her first deer! Another picture of the Amman's big gator! Clayton Hock got his first buck, 9 points! 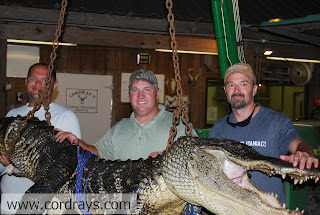 Joe Amman and his buddies wrestled in a BIG one at 12 feet long! 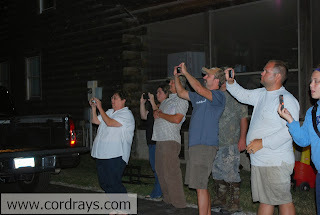 The big ones always bring out the cell phone cameras! Mary Eliot Stone brought in her first deer with Roy Smoak and Will Stone. She joined the Cordray's First Deer Hall of Fame! Kaylin Compton got dunked by her dad when she brought in her first deer! Cain Markosky brought in a 10 point buck that he took with his bow! Kim Craven's 9 point was her very first deer! She got dunked! Trey Evans brought in his first deer! Tristan is my dentist - and my oldest son - but hopefully he won't use this big pry bar on me! Tristan's gator was 10 feet long. Tristan Cordray is joined by his boys, Banks and Case, as he shows off his big bull gator!